Built by Mitsubishi at Nagoya, estimated date of assembly October 1943. Parts from A6M5 Zero 4241 were used in the main body of the aircraft, revealing the frantic pace of production. Delivered to the Imperial Japanese Navy (IJN). This Zero operated from Rabaul. This Zero was abandoned at an airfield near Rabaul. During 1974, the main wing and forward fuselage center section was recovered from Rabaul and imported to Light Aviation Co., Ltd, Japan. This Zero was purchased by Nobuo Harada, along with other Zero parts. This Zero was restored by Nobuo Harada. Parts from other Zeros wrecks from Colonia Airfield on Yap were used to restore this aircraft to static display. The project took a total of twenty years: from recovery in 1980 until completion in 2000. 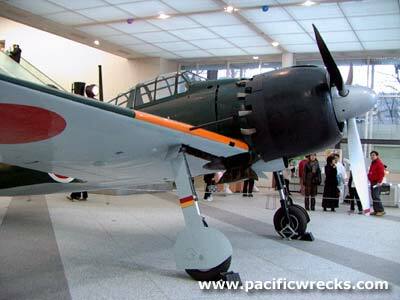 Restored in the markings of A6M5 Zero of the 281 Kōkūtai with tail code 81-161. After restoration, displayed at the Kawaguchiko Car Museum until 2002. 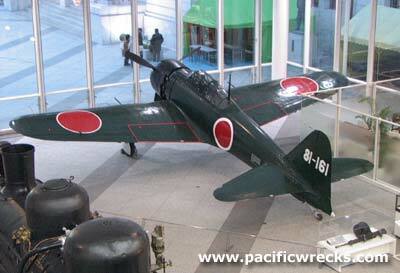 Harada donated the aircraft to Yasukuni Jinja Yushukan (Yasukuni Shrine) Museum in Tokyo. One of this Zero's former pilots served as an attache to the Japanese Embassy in Washington DC. Note: Other sources list the manufacture number of this aircraft as either 4240 or 4241 which were aircraft whose parts were used in this restoration.